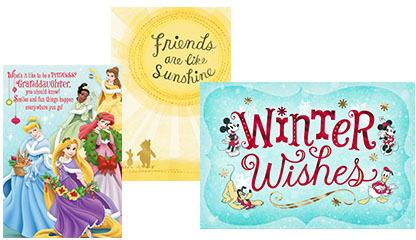 Print and bring your coupon in to a Hallmark Gold Crown store, select any 2 Disney® greeting cards priced over $3 and save. 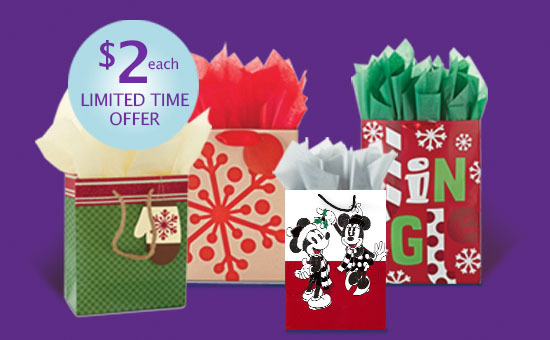 Save even more when you combine this offer with the gift bag offer below and ‘3 cards for $10’. Printed coupon required for this offer. This gift bag offers is only available at participating stores. Click here to find one near you. *Hallmark Rewards members are entitled to purchase up to 5 Hallmark gift bags for $2 each (plus applicable sales taxes) when they buy 3 or more greeting cards in the same transaction at participating Hallmark Gold Crown store. This offer can be combined with the ‘3 cards for $10’ offer. Returns will not be accepted under this offer; however any unused gift bag in good saleable condition may be exchanged for any other qualifying everyday gift bag upon presentation of the original receipt.